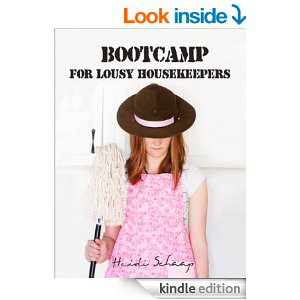 Hello, Bootcampers! I'm just popping in for a moment on this busy day to let you know about a promotion that Lulu Press has happening right now. 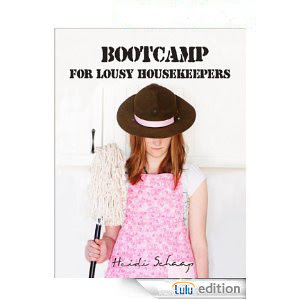 The Bootcamp for Lousy Housekeepers book is available in Kindle format on Amazon, and also in perfect bound paper through Amazon, as well. But it's also available through Lulu press in coil-bound format. Some Bootcampers LOVE the coil-bound version, as it makes it easier to print off pages and use it as a planning binder as they're getting their homes together. However, this free mail shipping deal through Lulu means you can get the coil-bound version for the same price with FREE SHIPPING. To sweeten the deal, I'm offering the Lulu coil-bound version for 25% off - that's only $18 - no promo code needed! 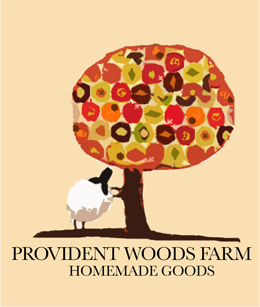 Just remember to use Lulu's code APRSHIP50 through April 22nd to get free mail shipping. This deal is only good through Friday evening, so grab yours today while the price is great! I hope this helps you get a jump on transforming your home from messed to blessed this spring!